Intellectual property consists of your knowledge, expertise, know-how, and experience that enable you to create and deliver your services to your customers. Intellectual property here is not meant to be in legal context such as trademarks, patents. IP here is used in the business context. IP can also be described as the collection of intangible assets in your company. Unlike tangible assets to your business such as computers or your office, intellectual property is a collection of ideas and concepts and know-how. Our intangible assets include our knowledge, our brands, our digital content and our know-how. As intangible assets are non-physical, their importance can sometimes be overlooked or misunderstood. Every company has IP. In small companies it is mostly trapped in the owners head or the longest serving person’s domain. If there is a go to person in a company for any problems or for anything out of the ordinary, then there is such a person in this company. The reason everyone go to one person for solutions, is not because they do not care or unable to act, only because the information or the necessary skills are not shared with them. We all have IP in our companies even if we are not aware of it. The unique way we run our operations, the way we solve problems, are all part of our IP we have created over the years. If there is IP in every company, why do we need to extract it and develop it? Depending on the company activities, we need to start from standardising our processes and procedures. People can act differently in different circumstances. But as a company our customers need to see a consistent behaviour from every staff member. Say we are cooking a meal for our friends. We need ingredients and some crockery in order to cook the food. We can cook it by trial and error each time so we can serve a good meal. Somehow we will do it and each time there will be some differences. Alternatively we can create a recipe using the ingredients we always use. And the recipe can be improved every time we cook the same food. Having a recipe means that we can share it with others and anyone who follows the recipe can cook the same food. Creating a recipe here is very much extracting our know-how, which is our intellectual property. Developing our company’s IP means, everyone in the company will have access the same know-how. Corporations who operate globally are successful, mainly because they have developed their IP in their business and use it globally. McDonalds has developed their IP so well that even a 16 year old can deliver their services. 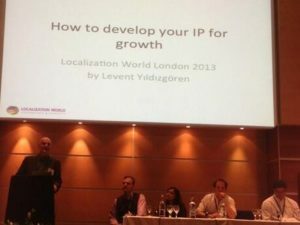 How relevant is it for the localisation industry? Localisation industry requires many different skills and expertise. It takes many years to get experience in the industry and training can be expensive too. Therefore this is very relevant for the localisation industry. OK, if we accept that developing our IP is the only painless and productive route for growth how we do we go about it? Having written procedures would be a good start. What do we do when a customer complaints. How much extra we need to charge if a customer suddenly changes the project specifications. Indeed do we charge extra? What do we do when a translator delivers sub standard work? Indeed what is the criteria for min acceptable standards? What actions would trigger doing something differently.